October 28, 1997. The Dow drops 500 points. Investors the world over receive a startling reminder that "what goes up, must come down." It is a profoundly unsettling experience for those of us who have either forgotten or have never known the experience of a bear market. Half of the money invested in U.S. stocks in this century entered the market from 1991-1996, making the dark days of October memorable for their bloodletting. Overall, this was just a scratch, and despite the optimism of so many investors, history has shown that the bear attacks time and time again. John Rothchild, critically acclaimed author of the bestselling A Fool and His Money, isn't even afraid to face a full-fledged bear market. In his topical and timely new book, Rothchild reveals how to prepare psychologically and tactically for the looming debacle. Breaking from the pack of investment books which tacitly assume a bull market, The Bear Book focuses on protecting assets and minimizing losses during a bear market and on taking advantage of unique opportunities for profit. With customary flair and style, Rothchild chronicles the long history of bear markets, exploring in detail exactly what constitutes a bear market and how it affects us. Along with his own expertise, the author draws on respected and knowledgeable names such as Jim Rogers, Jim Grant, and Martin Zweig, among a host of prominent investment advisors, strategists, and fund managers. The result is a comprehensive chronicle that deftly and definitively fills the "bearish information gap." 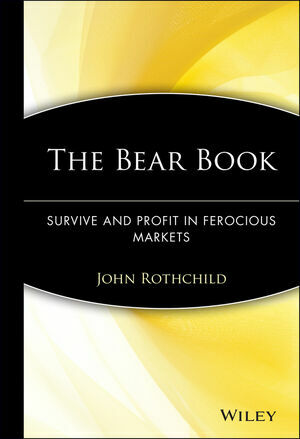 John Rothchild's masterful penchant for blending wit, good storytelling, and sound investment analysis makes The Bear Book both informative and vastly entertaining. He distinguishes the characteristics of past bear markets, examining what triggered them, how long they lasted-and why. He probes the unique psychology of bearish investing, concentrating on which types of investments generally do well during a downturn in the market. His often surprising answers to some straightforward, no-nonsense questions clarify, among other key issues, what can happen to mutual funds in a bear market, and exactly what the dangers are of selling short. Of critical importance is Rothchild's overview of the alternatives to stocks, including gold, bonds, and money market funds, as well as tips on what stocks to buy when the market starts to turn bullish again. For historical perspective, The Bear Book also includes a unique and eye-opening account of the Crash of '29 and its survivors. Profiles of prominent bearish investors-Roy Neuberger and Philip Carret, among them-contain illuminating long-term perspectives on the ups and downs of the stock market over the past fifty to seventy-five years. A bracing tonic for investors at all levels of experience, The Bear Book offers a veritable blueprint of the various stages of a typical bear market. It will prove invaluable to those of us who wish to protect our savings -and peace of mind -whenever the market drops. JOHN ROTHCHILD is the bestselling author of the critically acclaimed A Fool and His Money and Going for Broke, among other books. He has also coauthored, with Peter Lynch, One Up on Wall Street, Beating the Street, and Learn to Earn. A former editor of the Washington Monthly and financial columnist for Time magazine and Fortune, Mr. Rothchild has also written articles for Harpers, Rolling Stone, Esquire, and many other periodicals. He has appeared on The Nightly Business Report, the Today Show, and CNBC. Are Stocks Really That Great? The Case for Cutting and Running. HOW TO SPOT A BEAR. IT'S A BEAR'S WORLD, AFTER ALL. There's Always a Bear Market Someplace. Jumping on the Next Bull. MY MUTUAL FUNDS WILL SAVE ME AND OTHER FALLACIES. The Short Sale Made Simple. Could 1929-That Is, 1932-Happen Again? John Rothchild, author of THE BEAR BOOK: Survive and Profit in Ferocious Markets wrote an editorial published in the September 6, 1998 issue of New York Newsday entitled "Are Investors Setting Free the Bears?"